I can’t resist a good old British heritage brand and I’ve recently been trying Zoflora*, the UK’s favourite household disinfectant brand, which is celebrating its 90th birthday this year. Zoflora is still manufacturing in its Huddersfield factory, since the brand began in 1922, and is known for its fragranced antibacterial disinfectant products. Originally created for use in Britain’s dance halls, it rapidly became a household favourite, replacing harsh carbolic disinfectants with fragrant, perfume enriched Zoflora. Zoflora has been on trend with each generation of user appreciating the new fragrances added to the range. Zoflora is introducing a brand new, limited edition fragrance, to add to the patriotic mood this year. Courtesy of new Zoflora Bluebell Woods, a distinctly British flower, homes around the country will be hygienically clean and filled with a delicate, floral scent of early summer. We’ve been trying it out and it really does smell lovely! 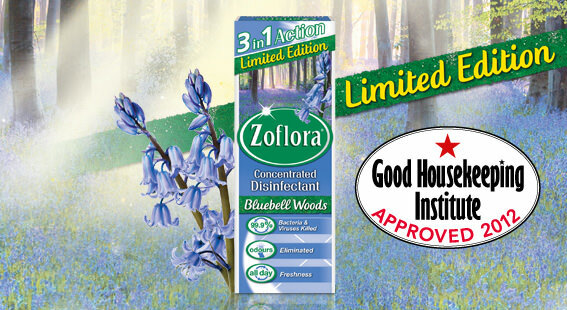 Zoflora’s Bluebell Woods is the only early summer disinfectant that kills 99.9% of bacteria and viruses, eliminates odours and leaves a fragrantly scented room. The 120ml bottle makes 4.8 litres of full strength disinfectant, offering outstanding value. Simply add to water and use all over to make the home germ free; from floors to tiles, work surfaces to sinks, toilets and bins to make your home fresh, fragrant and ready for the summer. It’s even suitable for pet areas, litter trays and pet toys, just allow the surface to dry before you let your pet near them.